Follow the artistic development of the Exalted roleplaying game all the way from its unused concept art to its current second edition splendour. Along the way, you'll see the world of Exalted brought to life through the talents of the industry's top artists, including Chris Stevens, Hyung-Tae Kim, Adam Warren and many, many more. 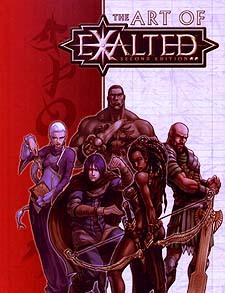 Within, lavish, full-colour art combines with commentary on the setting's important people and places to reveal what makes Exalted one of the most sweeping and epic games on the market, while personal anecdotes by the creators gives a behind-the-scenes peek into the process of illustrating this beloved one-of-a-kind game.